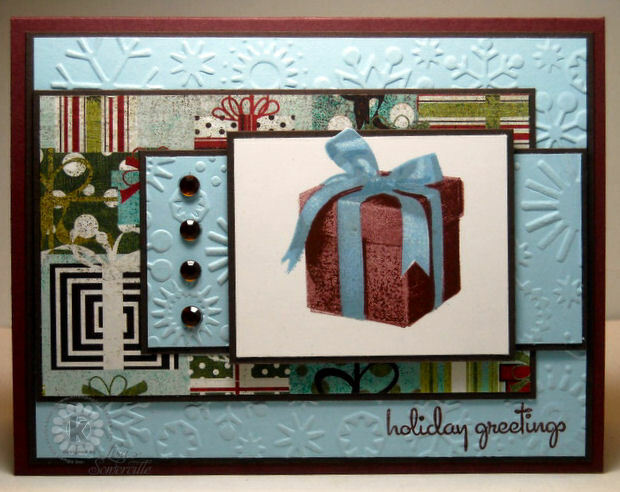 Designs by Lisa Somerville: Kitchen Sink Stamps - 6 Months 'til the Holiday Sale! Kitchen Sink Stamps - 6 Months 'til the Holiday Sale! Happy Kitchen Sink Stamps Monday, I'm so glad you stopped by today! Today in the Kitchen we are celebrating 6 Months 'til the Holiday Sale! Yep, that's right, Kitchen Sink Stamps is running the BIG SALE with all items in the store 20% off through Wednesday June 23rd. BUT WAIT, that's not all! Orders that total $60 before shipping, will also receive a FREE Mystery Stamp Set (Retail Value: 27.95)! To save on your order, simply CLICK HERE then enter code STAR in the promo box. It's important for you to click the above link and enter the promo code in order for you to get the discount. Today, I've created a few things to inspire you to get started on your Holiday projects. This first card uses images from Kitchen Sink Stamps Multi Step Gift, the sentiment is from Kitchen Sink Stamps Ready 4 Any Holiday set. The gift is stamped in Burgundy and shades of blue (recipe below) after the image was stamped I used the Out of the Box technique to add a bit of interest to the image. The Light Blue panels are embossed with the CuttleBug Snowflake folder. Here's a quick gift box using image from Year of Thanks II. I simply added a layer of Blue card stock and a piece of Basic Grey Figgy Pudding to cover the top of my box. 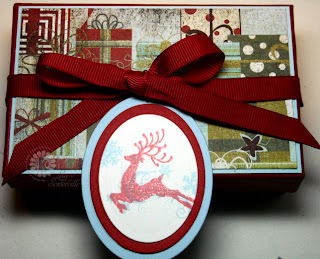 Then stamped the Snowflakes in Blue (omitting the text) and the Reindeer in Red (omitting the text) on my White panel, then cut and layered using Spellbinders Oval Dies. My next card using images from Kitchen Sink Stamps Multi Step Pine Trees, Multi Step Ornament and Stars, and Multi Step Gift (sentiment). You can use several shades of ink to stamp the pines, but in my video I'm going to show you how I used just one shade of Green. The sentiment from Kitchen Sink Stamps Multi Step Ornament and Stars is stamped in Red on a White panel, cut with Spellbinders Circle Dies, then layered on Green and Red panels. The Green background is embossed with a Texture Fades Embossing Folder. 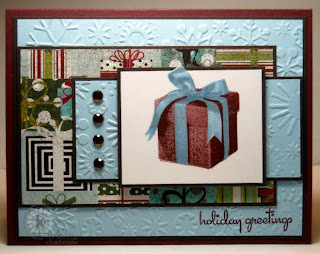 To see more projects I've created with Kitchen Sink Stamps click here. Gorgeous work on that fabulous package, Lisa!! I love the beautiful colors!! Thanks for your wonderful video!! I watched it and discovered that I had never noticed that the ribbon had a 4th layer!! Love all your festive Christmas creations!!! Fabulous work Lisa. Your cards and projects using the Kitchen Sink stamps are always so good. Great tutorials and great cards. TFS. Amazing creativity, and an impressive start to holiday cards. Projects are beautiful, as always, and 2, two, too videos, wow! Beautiful work, Lisa!! Your stamped images are beyond fantastic! Great color recipe tutorials as always! You've been busy!! :) Wonderful cards - all of them have such a great mix of colors and papers! Oh my, Lisa! These are all sooo wonderful! 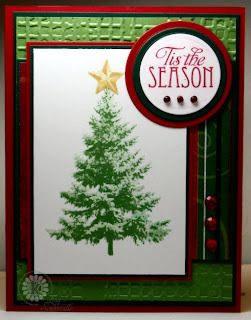 LOVE the colors on the first, you tag is perfect, and the tree is lovely!! Lovely cards and isn't it funny to be making Christmas cards in June?